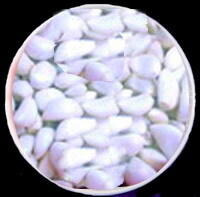 For garlic pickle never use the packed pearls available in the western countries but always buy fresh garlic clusters looking like big onion with bigger pearls. 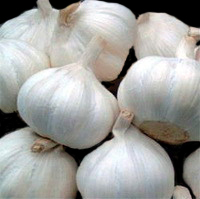 Never also buy single pearl varieties known as Nepali garlic or Mountain garlic (MalaippUNDu). The pearls should be slightly cream yellow in colour if fresh but not brownish as they are stale varieties. Peel the skin of Garlic cloves. Roast the mustard and fenugreek seeds dry and then grind them together finely. Mix these with the salt, chilli powder, turmeric powder, citric acid, oil and the garlic cloves. Ensure that the ingredients including the garlic pearls are below the oil surface always. Taste and if you need a little more salt or chilli powder add. Keep these in an air tight jar. Toss daily once. You can use after about a month. Store in a cool place. Peel the skin of Garlic cloves. Roast the mustard, fenugreek, cumin, and aniseeds along with Bishop’s weeds dry and then grind them together with rock salt finely. Mix these with the table salt, chilli powder, turmeric powder, garam MaSAla powder, citric acid crystals, asafoetida and sugar. Taste if any ingredient is to be adjusted. Mix it well with garlic cloves and a little oil. Keep these in an air tight jar. Pour the remaining oil over this to ensure that the pearls are always under the oil surface. Daily toss once. The pickle will be ready after 30 days. Store in a cool place. Here we do not add oil, red chilli powder or citric acid but pure white vinegar as well as cut 15 green chillies (medium). 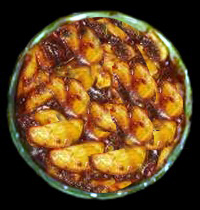 The ingredients must be below the surface of vinegar. The rest of the procedure will be exactly the same as above. After 10 days taste the pickle and adjust any ingredient needed. The pickle will be ready in a month. Remove the fibres and seeds of tamarind and soak it in a cup of water. Peel the garlic. Grind the red chillies roughly and then add the garlic cloves and salt. 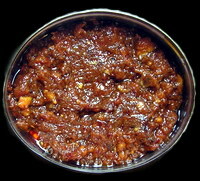 Grind finely along with the soaked tamarind with its water. After grinding into paste remove and clean the jar of the mixie with a little water and add this also to the paste. Take oil in a kaDAi and add mustard seeds. When they splutter add the garlic paste to it and jaggery. Sauté well till the contents leave the side. Remove from fire. When warm add the pre dry roasted fenugreek powder and asafoetida. Mix well Store after it is cooled in an air tight bottle. 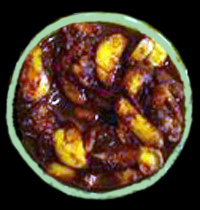 You can use it with plain rice, curd rice, tOSai, iDli etc. This entry was posted on February 4, 2012 at 10:19 pm and is filed under Indian Pickles with tags ajwain, aniseeds, asafoetida, Bishop's weeds, citric acid crystals, cumin seeds, fennel seeds, fenugreek, garam masala powder, garlic, garlic cloves, garlic pearls, garlic pickle, garlic tokku, green chillies, Indian pickles, jaggery, kalajeera, kalonji, mustard seeds, omam, Poondu urugai, pundu tokku, pure white sesame oil, red chilli powder, red chillies, refined oil, rock salt, sugar, table salt, tamarind, til oil, turmeric powder. You can follow any responses to this entry through the RSS 2.0 feed. Both comments and pings are currently closed.